This YardPro Single Gable Carport is what you need to keep your car under cover and save it from the strong Aussie sun or hail. 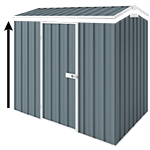 This YardPro Sing Gable Roof Colour Carport is 3.96m x 5.91m. It's great for keeping your car under cover and safe from the strong Aussie sun or hail.